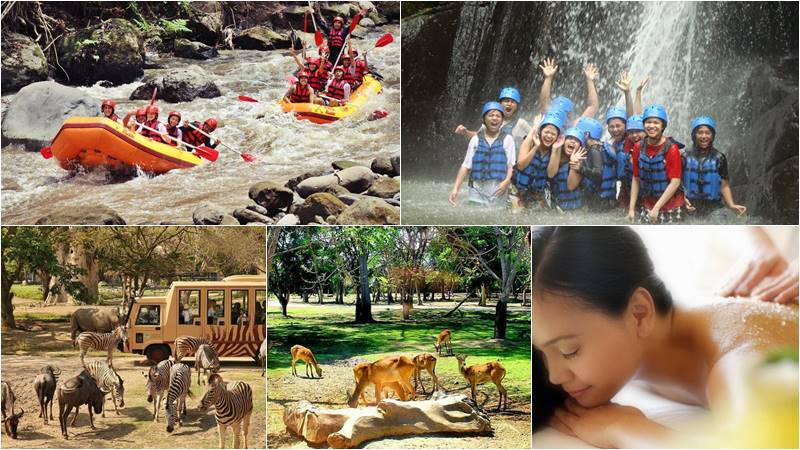 Rafting + Bali Safari + 2 Hours Spa is an amazing Bali Rafting Tour Package, join us on Bali whitewater rafting at Ayung river with lots of fun adventure then combine with Bali Safari and Marine Park and will end with 2 hours spa packages. This combination package will give you the most memorable rafting in Bali. Let’s join us and get special price from Bali rafting adventure. 14.00 – Visit Bali Safari & Marine Park. 17.30 – Enjoy 2 Hours Spa treatment. Join our professional Ayung River Rafting for fantastic Bali rafting experiences, enjoy a unique and unforgettable tour through winding gorges, lush jungle and magnificent terraced rice fields. With few speeds of water, the volume of water is stable all year round, allowing you to have great fun with calmness. From the starting point, all participants will be equipped with life jackets and helmets. Our experienced guides will guide you for about 2 hours through your exciting Ayung rafting adventure. Follow his instructions and paddle along the way, laughing, shouting, and an amazing adventure. This is the best way to feel the Ayung River’s wonder. An amazing adventure into a wild life, from the Sumatran Tiger and Elephants in the Sumatra jungle to the Manyara-Afrika lake hippos. Explore hundreds of animal life and enjoy over 60 species at Bali Safari Park. One of our signature activities here at the park is an exciting and adventurous Safari Journey that takes visitors through Indonesia, India and Africa’s habitats. Face many animals, you have the chance to see our natural wildlife all living together in these open areas and you can take as many photographs as you like, all of the comfort and safety of your air-conditioned safari tram with your very own personal guide! Get close and personal to the animals as they approach your side of the window. Enjoy plunging into ‘Lake Manyara’ where the Hippopotamus hang out all day to stay cool, get close enough to count the stripes of the zebra, enter the den of the Lion if you dare! Do your best to spot the tigers in the dense jungle, captivated by the huge size of our White Rhinoceros. Ticket for the rafting with 2 options: Ayung River or Telaga Waja river. Ticket to Bali Safari & Marine Park with Jungle Hooper package.